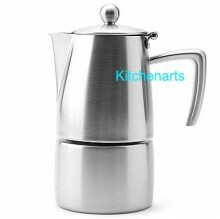 SLANCIO Espresso Maker Super sleek Satin Finish Brushed 18/10 inox. Made in Italy by Ilsa. Click the button below to add the Slancio Stovetop Espresso Maker 6 Cup Made in Italy to your wish list.